Thomas William "Tommy" Davis (born August 18, 1972) is an American financial executive. From 2005 to 2011, Davis was head of external affairs and the chief spokesperson of the Church of Scientology International and Senior Vice President at the Church of Scientology Celebrity Centre International from the early 1990s. Between 2011 and 2013, Davis did not make any public appearances in the media. In June 2013, it was revealed that Davis and his wife had relocated from Gold Base in Riverside County, California to Austin, Texas. He currently resides in Los Angeles. In 2016, he became the General Manager of Consolidated Press Holdings North America LLC, a private investment vehicle owned by Australian billionaire James Packer, but his employment was terminated in July 2017 . Davis previously worked for the Sea Org as a non-uniformed member. According to a Church of Scientology press release, in 2001 Davis was the Celebrity Centre's Vice President. He was the chief spokesperson of the Church of Scientology from 2005 to 2011, a position previously held by Mike Rinder. On June 13, 2003, Davis went with actor and Scientologist Tom Cruise and Kurt Weiland, director of external affairs for Scientology's Office of Special Affairs and Scientology vice president of communications, to meet with then-United States Deputy Secretary of State Richard Armitage. In the half-hour-long private meeting, they raised concerns with Armitage about the treatment of Scientologists in Germany and other countries. Davis was a senior-level Scientologist, spokesman for the Church of Scientology, and a member of the Church of Scientology's Sea Organization or "Sea Org". He is a member of the International Association of Scientologists, and as of 2006 was listed as a Patron in their publication Impact Magazine. Davis accompanied Rolling Stone writer Janet Reitman along with former head of Scientology's Office of Special Affairs Mike Rinder on a tour of the Gold Base in Hemet, California in 2005. In 2007, Davis gained international attention from events surrounding the making of a documentary about Scientology entitled "Scientology and Me", screened as an installment of the BBC public affairs series Panorama. The Panorama reporter, John Sweeney, reported that he met with Davis early on and could not reach agreement with him on whether individuals attacking Scientology should be interviewed for the film, and whether the program should refer to Scientology as a "cult". As the BBC documentary was filmed, Scientologists made a parallel documentary, a camera crew shadowing Sweeney and chronicling his work. Davis made allegations against Panorama and the BBC that they were "spying" on the church of Scientology and harassed the reporter, John Sweeney by stalking him to various meetings with critics but he never filed a report against Sweeney. While Sweeney was visiting the Scientology exhibition "Psychiatry: An Industry of Death", Davis accused him of being biased and of having been too easy on one of his interviewees. Sweeney lost his temper. The Church of Scientology released the resulting footage, showing Sweeney becoming angry, on YouTube, and the counter-documentary attacking Sweeney's methods was posted to UK politicians and media organizations. Panorama responded by posting its own YouTube clip, showing Davis losing his temper and abruptly ending an interview when Sweeney used the words "sinister cult". The BBC subsequently stated it was happy that on the whole, Sweeney had performed his work in a fair and proper manner. In the same BBC documentary, Davis interrupted when celebrity members are asked about Xenu, saying: "None of us know what you're talking about. It's loony. It's weird." In a May 8, 2008 appearance on CNN, Davis was asked by CNN's John Roberts if "... the basic tenet of the Church of Scientology is to rid the body of space-alien parasites, to clear oneself"; Davis responded: "Well, John, does that sound silly to you? I mean it’s unrecognizable to me." In response, Tony Ortega of The Village Voice stated "It’s also a grand tradition, among Scientology spokespeople, to act bewildered when they’re facing a camera and they’re asked about Xenu and space-alien thetans. Tommy Davis is just doing what other mouthpieces have said in the past." In March 2009 Davis was interviewed by investigative journalist Nathan Baca for KESQ-TV and was again asked about the OT III materials containing the Xenu myth. When read an excerpt from Hubbard's writing, Davis told Baca "I'm familiar with the material," and said that the issue at hand was "the confidential scriptures of the Church," and thus refused to elaborate on the issue. After the death of Jett Travolta, son of celebrity Scientologist John Travolta, the Church of Scientology came under fire from critical groups accusing it of being irresponsible; Jett had died of a seizure soon after being taken off his medication. Davis responded by denying that Scientology keeps people from taking medications, and also denying that it claims to cure disease. He stated in one interview, "The bottom line is that Scientologists seek conventional medical treatment for medical conditions." 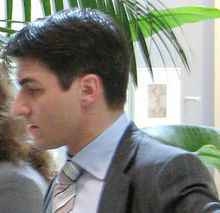 Davis was interviewed by journalist Martin Bashir for the ABC News program Nightline, in a piece called "Inside Scientology", which aired in October 2009. Davis ripped off his microphone and stormed off the set of the interview after he was questioned about whether he believed that 75 million years ago a galactic ruler called Xenu brought individuals to Earth and killed them in volcanoes. An hour before the segment aired he appeared at ABC headquarters and demanded that a security guard let him in. Security called Nightline representatives, and they met with Davis who demanded the segment not be aired and he be allowed to speak with Bashir. Davis was told that Bashir could not meet with him and that the interview was already edited and would air. The following week director Paul Haggis accused Davis of lying on CNN, when Davis said disconnection did not happen, but Haggis and his wife were "ordered" by Scientology to disconnect from family. Haggis, in the same letter, announced he was leaving the organization. Davis responded that Haggis's claims were based on misunderstandings. In 2009, Larry Anderson, an actor, spoke with Davis about getting his money and leaving Scientology, which was reported in the St. Petersburg Times. In July 2010 the Church of Scientology International publicized a "Scientology Newsroom" website tailored for members of the media; Davis was one of four international representatives for Scientology listed as spokespersons. John Sweeney and Mike Rinder, a former Scientology relations officer stated in a BBC documentary, The Secrets of Scientology, that Davis authorized the following of Sweeney in order to provoke a reaction by mental engagement. Davis was quoted as saying "I can drive him 'psychotic'." Davis is the son of real estate investor William Davis and film actress and Scientologist Anne Archer. He has a half-brother, Jeffrey Tucker Jastrow. His stepfather is an Emmy-award winning actor and producer, Terry Jastrow. Davis was raised as a Christian Scientist, but his mother joined Scientology when he was 3 years old. Davis claims that after taking two courses at the Celebrity Centre, he became a Scientologist at the age of 17. He attended Harvard School For Boys in Los Angeles, a private Episcopal church-affiliated college preparatory school (now called Harvard-Westlake School). In 1990, he was accepted at Columbia University. He attended college for a semester, but dropped out to join the Sea Org. Davis is a friend of actor and Scientologist Tom Cruise, and a former friend of actor Jason Beghe, who left the church in 2007. He is independently wealthy as his family obtained success in the real estate business, and told Rolling Stone: "I have enough money to never work a day in my life." Davis was married to Jessica Feshbach, who was a fellow spokesperson for the Church of Scientology but left that position in mid-2011. The pair divorced in 2018. They have two children, Chloe and Delilah. ^ a b c Wright, Lawrence (February 14, 2011). "The Apostate: Paul Haggis vs. the Church of Scientology". The New Yorker. Retrieved March 8, 2011. ^ a b Shaw, William (2001-02-06). "Multimillonarios, Famosos Y Cienciologos: Estrellas de la música y el cine lideran la tarea proselitista de la iglesia de L. Ron Hubbard". El Mundo. www.elmundo.es. Retrieved 2008-05-30. ^ a b c d Blake Bandy (Fenton Kritzer Entertainment). "Anne Archer — Biography". Internet Movie Database. IMDb.com, Inc. Retrieved 2008-05-30. ^ a b c d e Reitman, Janet (February 23, 2006). "Inside Scientology". Rolling Stone. Retrieved 2006-07-16. ^ a b Wright, Lawrence (2011-02-14). "The Apostate: Paul Haggis vs. the Church of Scientology". Vanity Fair. ^ "Where's Tommy Davis". Nine Network. Retrieved 2012-08-20. ^ Glick, Julia (March 3, 2009). "Riverside County supervisors OK twice-revised picketing ordinance". The Press-Enterprise. www.pe.com. Retrieved 2009-03-04. ^ "Mariah Carey, James Packer -- Deep in 'Settlement Negotiations' ... She Blames Ex-Scientology Honcho for Breakup". TMZ. Retrieved 2017-01-11. ^ "Last scientologist quietly leaves the court of James Packer". Retrieved 2018-01-09. ^ Church of Scientology (2001-08-09). "Celebration Gives Clue Why Young Hollywood Loves Scientology - 'Joy of Creating' Inspires Artistic Creations at Star-Studded Event". Press release. PR Newswire. ^ a b c d Morton, Andrew (2008). Tom Cruise: An Unauthorized Biography. New York: St. Martin's Press. pp. 243, 317. ISBN 0-312-35986-1. ^ a b Staff (2006-08-25). "Tom 'Incensed' Sumner's Wife". New York Post. N.Y.P. Holdings, Inc. p. 14. ^ a b Derakhshani, Tirdad (2006-08-26). "Cruise camp: sorry about Shields". The Philadelphia Inquirer. ^ a b "Scientology and Me: transcript". Scientology and Me. BBC News. 2007-05-14. Retrieved 2008-05-30. ^ Ortega, Tony (2008-05-14). "Jason Beghe to Scientology Mouthpiece Tommy Davis: 'You're Losing Your Soul'". Runnin' Scared. The Village Voice. Archived from the original on 2008-05-17. Retrieved 2008-05-30. ^ Friedman, Roger (2006-03-02). "Cruise, Travolta: Rolling Stone Gathers Moss". Celebrity Gossip. Fox News. Retrieved 2008-01-28. ^ International Association of Scientologists (2004). "Founding Patrons". Impact Magazine. Church of Scientology (109). ^ International Association of Scientologists (2006). "Patrons". Impact Magazine. Church of Scientology (114). ^ a b c d e f g Smith, David (May 13, 2007). "The BBC man, the Scientologist — and the YouTube rant". London: The Observer. Retrieved 2006-07-16. ^ "Nine denies church motive". The Australian. May 18, 2007. Retrieved 2008-12-15. ^ a b c d e "BBC man rebuked over Scientology show". Digital Spy. May 14, 2007. Retrieved 2008-12-15. ^ Roberts, John (May 8, 2008). "Scientologists decry threats: CNN's John Roberts talks to a Scientology spokesman who says an anonymous group is terrorizing the church". CNN. Retrieved 2008-05-08. ^ Ortega, Tony (May 8, 2008). "Scientology Spokesman Gives Non-Answers on CNN". Runnin' Scared. The Village Voice. Archived from the original on May 9, 2008. Retrieved 2008-05-08. ^ a b Baca, Nathan (March 12, 2009). "Scientology Official Addresses Works of L. Ron Hubbard". KESQ-TV. www.kesq.com. ^ a b c Tanner, Lindsey (Associated Press) (January 7, 2009). "Silence fuels speculation over death of Travolta's son". Waterloo Region Record. p. C10. ^ a b Wallace, Kenyon (October 26, 2009). "Canadian filmmaker Haggis renounces Scientology". National Post. The National Post Company. ^ a b c "Scientology flack strikes out". New York Post. New York Post. October 27, 2009. Retrieved 2009-10-27. ^ a b "Paul Haggis on Scientology: 'Morally reprehensible'". The Los Angeles Times. October 27, 2009. Retrieved 2009-10-29. ^ "Director Haggis says he's leaving Scientology". CNN. October 27, 2009. Retrieved 2009-10-29. ^ "Scientology's New Face". The Daily Beast. October 27, 2009. Retrieved 2009-10-29. ^ "Larry Anderson says he's leaving Scientology". St. Petersburg Times. January 24, 2010. Archived from the original on August 19, 2010. Retrieved 2010-03-16. ^ Childs, Joe; Thomas C. Tobin (January 24, 2010). "Larry Anderson, star of Scientology's 'Orientation' film, wants his money back". St. Petersburg Times. Archived from the original on March 23, 2010. Retrieved 2010-03-16. ^ Erin (July 19, 2010). "Scientologists Unveil 'Scientology Newsroom'". Crushable. b5media inc. Retrieved 2010-10-28. ^ "Church of Scientology International Contact Information". Scientology Newsroom. Church of Scientology International. 2010. Retrieved 2010-10-28. ^ a b Sweeney, John (September 28, 2010). "The Secrets of Scientology". Panorama. BBC. ^ "Terry Jastrow". IMDb. Retrieved 2017-01-11. ^ "Travolta spearheads Scientologists' attack on BBC". Daily Mail. May 15, 2007. Retrieved 2006-07-16. ^ Ortega, Tony (September 16, 2008). "Jason Beghe Is Still Denouncing Scientology -- This Time in Germany". Runnin' Scared. Village Voice. Archived from the original on September 18, 2008. Retrieved 2006-07-16. Wikimedia Commons has media related to Thomas W. Davis. This page was last edited on 30 March 2019, at 09:34 (UTC).